How Many Calories Are in a 12 oz Can of Pop? How Do Saturated Fats Affect Health? Foods that contain "empty calories" tend to be high in calories and low in nutrients. If you are cutting calories, you should be especially sure to avoid empty calories to obtain adequate nutrients while decreasing your calorie intake. Even if you aren't dieting, you should only consume empty-calorie foods occasionally, as they can have negative health effects when eaten frequently. Empty calories may come from fats or sugars. Empty calorie foods are those that contain no nutrients and a large amount of calories. These include sodas and most candy. 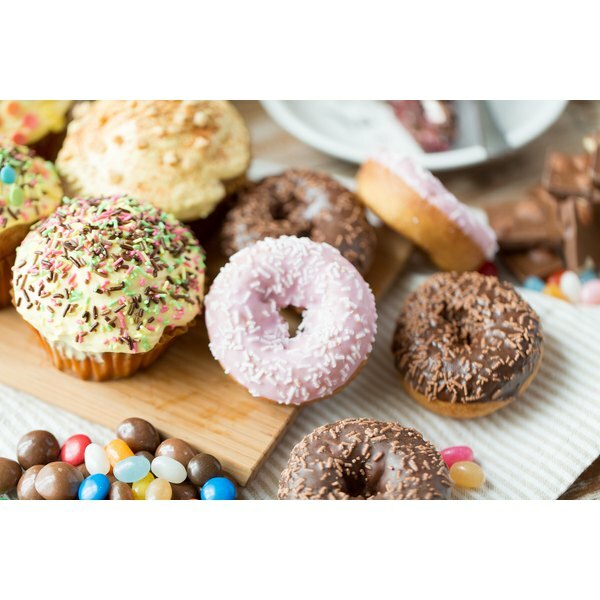 The most common empty calorie foods in the American diet, according to USDA MyPlate, are cakes, cookies, pastries, donuts, sodas, energy drinks, sports drinks and fruit juices, cheese, pizza, ice cream, sausage, hot dogs, ribs and bacon. Some of these foods have high amounts of fat, while others contain added sugars. However, some, like ice cream and pastries, contain both. Other sources of empty calories may contain important nutrients, but their calorie count is so high that it makes little difference. Examples include fried chicken, whole milk and regular ground beef, which contain protein as well as a high amount of solid fats, as well as sweetened applesauce and cereals, both of which contain fiber and other vitamins, as well as added sugars. Choose low-calorie options when it comes to these foods, like low-fat milk, boneless, skinless chicken and unsweetened applesauce and cereals. The daily recommended intake for empty calories varies by age group and gender. You can be a bit less worried about empty calories if you are physically active, since activity increases calorie requirements. According to the USDA MyPlate, you should limit your empty calorie intake to 260 calories if you are an adult woman ages 19 to 30, or 160 calories if you fall into the age 31 to 50 range. Women over 50 should only have 120 empty calories per day. Adult men ages 19 to 30 should only have 330 empty calories per day, while men ages 31 to 50 should have only 265 empty calories daily. Men over 50 should limit their intakes to 260 empty calories per day. It's okay to enjoy empty calorie foods every now and then, but excessive intake can increase your obesity risk and affect overall nutrition. If you have children, you should be especially careful to limit their intakes of empty calories. According to the National Institutes of Health, a 2010 study revealed that almost 40 percent of the calories consumed by 2- to 18-year-olds are empty calories. Most doctors recommend that children obtain 8 to 20 percent of their calories from empty calorie sources. Adults and children can improve overall health and decrease empty calorie intake by limiting portion sizes and eating high-nutrient foods throughout the day. Keep in mind that beverages can be a source of empty calories, too. Avoid beverages with added sugars and choose low-calorie drinks, like water, unsweetened tea, or zero-calorie flavored water. What Is Average Caloric Intake of People?